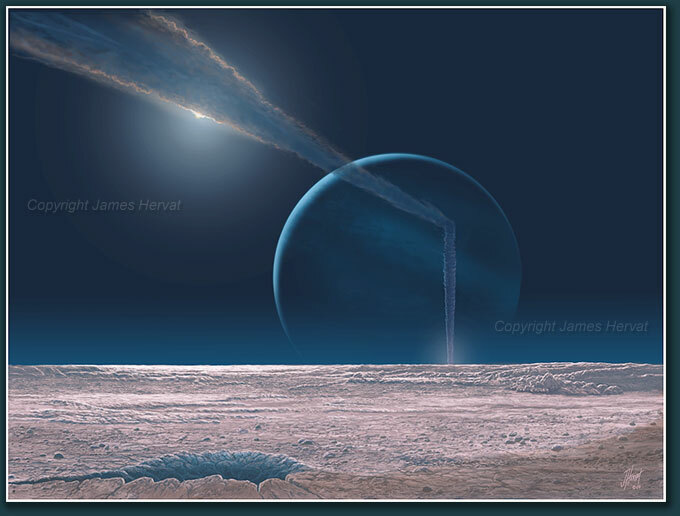 Triton Landscape by James Hervat - A cryovolcano plume rises five miles above the bleak, deep-frozen landscape of Neptune's large moon, Triton. Triton Landscape (2009) - Of the many stunning discoveries by the two Voyager spacecraft during their epic survey of the "Gas Giant" planets, one of the most unexpected revelations came at the cold outer reaches of the solar system. While traversing the Neptune system, Voyager 2 turned its cameras to the large moon Triton and recorded several active cryovolcanoes--ones that eject an icy, gaseous mixture rather than lava. Plumes from these eruptions rise 5 miles into the moon's thin atmosphere, where gentle winds can carry them hundreds of miles over the landscape.